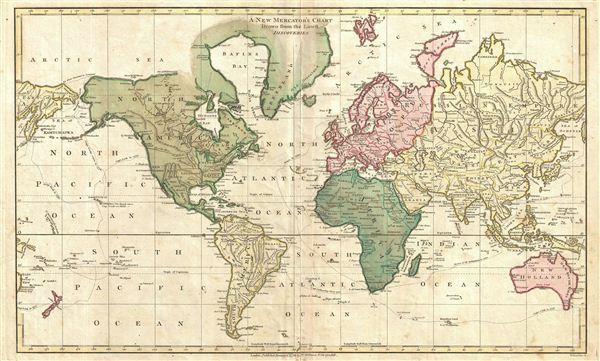 A finely detailed first edition 1794 map of the world on a Mercator projection by Robert Wilkinson. Wilkinson's map covers the entire world with color coding by continent. The exploratory routes taken by Captain Cook are noted. In Australia, here labeled New Holland, Van Diemen's Land or Tasmania, is attached to the continental mainland. The English colony of New South Wales and the settlements at Botany Bay and Port Jackson (Sydney) are identified. The disputed sea between Japan and Korea is here identified as the Corean Sea. As this map predates Vancouver's explorations, the island of Vancouver is still attached to the North American mainland. As this map predates the Louisiana Purchase, the United States extends westward only as far as the Mississippi River and does not include Florida, then a Spanish Possession. Engraved by Thomas Condar for the 1794 first edition of Robert Wilkinson's General Atlas. Good. Minor discoloration and verso repair on original centerfold. Else clean.